This conservation resource was created by Hillary Clark, Dylan Kresge, Brian Lee, and Aza Fynley Kuijt. North American salmon have significantly shaped the ecological, cultural, and economic standards of the Pacific Northwest. Before European settlement, salmon played an essential role in traditional environmental marine management for many coastal indigenous people. Following the arrival of North American settlers, First Nations people lost much of their traditional and cultural relationship with salmon. Today salmon farming (also know as aquaculture) has grown into a large industry across the Pacific Northwest, leading to a decline in wild salmon populations. Recently, Indigenous Peoples and salmon farmers have been in conflict over salmon habitat management. First Nations people are advocating for the restoration and protection of wild salmon habitat and to regain their rights as ecological stewards of the land. Opposingly, modern North American salmon farmers fight for jurisdiction of their agricultural lands; arguing that habitat restoration jeopardizes the economic viability of salmon farming, resulting in the loss of the farmers’ livelihoods. While these groups continue to dispute over the management of salmon, scientist are researching the possible effects salmon farming has on the health of humans, salmon in captivity, salmon in the wild, and other marine species in the pacific northwest region. Wild salmon run, Sooke River, October 2017. Photo by Hillary Clark. CC By-SA 3.0. Salmon is one of the most popularly consumed fish in today's society because of its unique taste and nutritious value. However, due to the decline in wild salmon fish stocks; salmon farming sites have been established in the Pacific Northwest to supply customers with the salmon that they demand, while not wiping out the wild salmon population. Salmon aquaculture has been a very controversial issue among British Columbia's indigenous first nations peoples, farmers, scientists, and consumers. This is because salmon aquaculture in the Pacific Northwest is a relatively new practice and has minimal environmental impact assessments to validate its sustainability and effects on other native marine ecosystems. Currently, there is no involvement of first nations people in the environmental impact studies that determine salmon aquacultures effect on British Columbia's coastal marine ecosystems. However, a 2007 report by the Special Committee on Sustainable Aquaculture (SCSA) has recommended that the BC ministries currently responsible for salmon Aquaculture management adhere to the principles of the new relationship. This "new relationship" is a government to government relationship with first nations people founded on the respect, recognition, and reconciliation of Aboriginal rights and titles. Having a well maintained and healthy relationship between first nations people, the provincial government, and the national government is vital for salmon aquaculture in the American Northwest because practically all of the wild salmon habitats and salmon farms are within the traditional territories of coastal indigenous people. The involvement of indigenous peoples is not only important because they have customary titles to the land, but because they have local and traditional knowledge about salmon in the area and their preferred habitat. In addition, it has been proven that co-management agreements that involve local/traditional knowledge are much more effective because the people in the area are personally invested and involved in the decision-making process that relates to their traditional territory and the resources within it. The Kwakwaka’wakw people, a group of indigenous people from the Broughton Archipelago, have seen the negative effects that salmon farming has on the environment and wild salmon in the area. Due to the fact that they have no say in how salmon farming is conducted in their traditional territory, the Kwakwaka’wakw people are in strong opposition to the continuation of salmon aquaculture in the area. Salmon is a very peculiar species of fish because they make anadromous migrations. This means that salmon are born in fresh bodies of water such as rivers or streams, then migrate down current into the ocean so that they can eat and grow during the adult stages of there life. When a salmon is fully matured it migrates back to the same river or stream where it was born to spawn and lay its eggs. In addition to being anadromous salmon are also semelparous, which means that after an adult salmon lays its eggs it dies. Although the salmon dies after reproducing, the salmon's body decomposes in the freshwater, allowing the nutrients that the salmon collected in the ocean to be released into the freshwater ecosystem. Due to this natural phenomenon of anadromous migration, freshwater habitats are essential to the survival of wild salmon populations, because without them salmon would not be able to spawn and reproduce. In order for salmon to inhabit a river or stream the water needs to be clean freshwater that is at most 68 degrees Fahrenheit (20 degrees Celcius). There also needs to be vegetation on the banks of the river or stream as well as downed logs in the water to provide protection from the sun, protection from predators, and to attract insects for salmon to consume. With these habitat specifications, other factors such as dams, pollution from agriculture and industry and disturbance or modification of river banks and spawning areas can also have a large negative impact on wild salmon populations. Since the 1800's the following events occurred involving salmon farming and traditional fishing in the Pacific Northwest. 1800's Commercial fishing began in the British Columbian area. 1916 Traditional First Nations reef-net fishing outlawed by British Columbian government. 1878 Beginning of regulation to eliminate Traditional First Nations fishing methods such as wiers in BC. 1970's The first small, local salmon farms are established on the British Columbian coast. The first to obtain a licence from the federal Department of Fisheries and Oceans was Moccasin Valley Marifarms in 1972 near Seachelt. 1980's Commercial-scale aquaculture begins and Atlantic salmon are imported and raised in BC fish farms. 1982 Canadian Constitution section 35 affirms any "existing Aboriginal or treaty rights." 1986 An inquiry of aquaculture is led by David Gillespie after a photoplankton bloom, resulting in his published report and recommendations. 1986 Fisheries Act is created to legislate protection of fish and habitat, management of fisheries, and pollution. 1992 Aboriginal Fisheries Strategy (AFS) is launched, aiming to integrate First Nations and increase their fishing access. 1994 The Allocation Transfer Program is created as part of AFS and allocates a portion of commercial fishing licences and gear to First Nations groups. 1995 BC places moratorium on issuing aquaculture licences. 1997 Salmon Aquaculture Review (SAR) is published, declaring salmon farming a low risk to the environment and the need for more research. Sept 2002 BC lifts the moratorium on issuing aquaculture licences. 2008 Traditional First Nations weir reestablished on the Cowichan River. 2012 Fisheries Act is amended and changes the definition of "Aboriginal Fisheries" to include use of fish for social or ceremonial purposes in addition to food. The provincial and federal government of Canada play the most important role in creating the rules associated with salmon farming. They are in charge of controlling the wellbeing of all stakeholders involved in salmon habitat restoration. The government has the responsibility of working with all sides of salmon farming restoration groups and organizations. Conflict from both an economic and environmental perspective creates an ongoing struggle to find a peaceful medium. In more recent news, a plan to help the salmon industry in a sustainable way is to introduce more traditional Indigenous involvement in the future of the salmon farming and fishing industry . It is the government’s role to track salmon numbers and enforce laws on the types and number of salmon that are permitted to be caught . In order to create a more sustainable salmon farming industry, the government has the ability to enforce laws and carry out punishment for breaking them . First Nations people play an important role in the salmon farming industry located on Canada’s Northwest. Having been on the lands surrounding British Columbia’s coast for thousands of years, they have become accustomed to living off the land, strongly relying on salmon as a source of food. Salmon were integrated into a significant part of First Nation culture and remains a driving component in their traditions . Indigenous Peoples and wild salmon were able to live a healthy mutualistic relationship for thousands of years, never worried about the concerns seen today such as the low numbers of wild salmon. First Nations people were able to catch a satisfactory number of salmon that would sustain them over the winter. Before and during the fur trade in the 17th century, salmon played a role in the development of First Nations economy. It was traded between other Indigenous people as well as with European settlers. Within the past hundred years, competition arose between First Nations and non-indigenous peoples for fishing salmon. More recently, when salmon farming was first introduced less than 50 years ago, First Nations people were once again forced to change and alter their way of life in order to accommodate for the pressures of salmon farming. Salmon farming has negatively affected the well-being and economic aspect of First Nations’ lives as well as altered their home and land. Salmon farming has negative effects on other aquatic organism that are caught and consumed by Indigenous Peoples, it also has negative effects on biodiversity on the land surrounding the farms which lie on First Nations territory. This is unjust to First Nations people who can no longer live on their territory due to the dangerous and harmful chemicals used in the salmon farming process. Salmon farming provides jobs to many local and international individuals. Through the primary position of working on salmon farms or through secondary operations of transportation and preparation. Salmon farming increases jobs for other individuals who move to salmon farming locations with their families. These individuals help contribute toward the economy by seeking employment within nearby cities and towns. Salmon farming companies also offer jobs to biologists and other researchers who work with the farmers, collecting data on the well-being of salmon and helping create the most productive and efficient farms. In today’s social environment with an active media, salmon farmers are constantly improving and developing new technologies to enhance their salmon farms. This includes the use of underwater cameras to monitor the salmon. Salmon farming is a desirable job for individuals seeking employment, working and living on the pacific northwest is globally known as a stunning location. Salmon farms remain a solid basis of a large economic movement within Canada and the United States and the restoration of salmon habitat will greatly impact salmon farms and all they provide. Today, environmental activist work to raise awareness and create a movement to end the negative outcomes that result due to salmon farming. Salmon farming show many negative consequences to the aquatic environment and harmful living conditions the farmed salmon are experiencing. Apart from farmed salmon, there are ramifications salmon farms have on wild salmon populations. Within the past hundred years of salmon fishing, the number of salmon leaving the ocean has increased at such a rapid pace, the wild populations have not been able to keep up with the amount humans are catching. Within a short number of years, salmon have been subject to pressure of climate change. Salmon runs are selective and salmon are sensitive to their given environment including water temperatures. With the rapid rate at which the earth is warming, both wild salmon and farmed salmon can become confused and can be harmed by the change in temperature. Salmon have made it onto the list of endangered species in the 1990s, this put them at a top priority for conservationists and environmental activist. Salmon farming or salmon aquaculture in the Pacific Northwest is done in open net-pens along the coast. They are called "open net-pens" because they do not have anything separating the farm from the ocean except for a thin layer of nets. These nets only keep the salmon inside the pens while letting all the waste, excess nutrients, and excess food flow into the ocean where they disrupt the natural balance of native coastal ecosystems. This method of salmon farming very closely mimics the natural life cycle that salmon go through in the wild. The salmon start off being born in freshwater tanks where they live for about a year; until they are mature enough to be transferred into salt water open net-pens. Then, after the salmon get transferred into the open net pens they live there for two or three years so that they can get to the appropriate weight and length to be harvested and then sold on the market. Traditional First Nation salmon management is the most effective way to catch salmon. First Nations people have lived harmoniously among salmon for thousands of years with no harm of disease or decrease in salmon population numbers. The re-introduction of safe catch and release methods refrains from catching unwanted fish and utilizing smaller catches not to waste any salmon. First Nations have been salmon fishing for the longest amount of time and had once developed safe sustainable techniques to catch salmon. These approaches are adaptable depending on environmental variables such as water depth and river velocity. Using these specially designed techniques such as weirs and other stationary traps allows for fishers to be more selective when retrieving the fish which helps control and track salmon population numbers. Moving away from nets will help conserve and protect species that would usually get caught in nets and die because they are not what fishers were looking to catch, this harms their own species numbers and result in unwanted waste. This would also help control the endangered species of salmon and only catch the species that are large in numbers. The industry of salmon farming impacts not only the environment, biodiversity and the economy, but also has direct social, cultural and health implications for people as well. From the late 1900s to early 2000s, when open net farms were most common, salmon stock were sometimes threatened by other marine mammals. Farm owners would attempt to defend their salmon stocks by registering for a license to legally kill the marine mammals when their stocks were in danger. Marine mammals such as seals and sea lions were often killed in these encounters, negatively impacting their populations not just by being shot, but also because of getting caught in the fish nets. The DFO, also known as the Department of Fisheries and Oceans Canada, has reported that from 1989 to 2000, the number of legally killed seals and sea lions was around 6000 individuals. 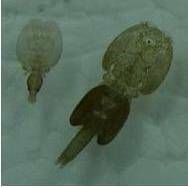 Male female sea lice. By 7barrym0re via Wikimedia Commons. Public Domain. Salmon farming has also been shown to have a direct impact on juvenile wild salmon. Due to the high density of salmon in open-net cages, there is an increase in farmed salmon stress levels. This overcrowding is associated with the drastically increasing number of sea lice and lice infestations. Studies in Norway, Ireland, and Scotland have found that there were higher population numbers of sea lice near salmon farms. The open-net cages which are used for salmon farming increase the chance of the sea lice transferring from the farmed mature salmon to wild juvenile salmon. Most of the salmon farming occurs in inlets near rivers, bays, or near the migratory routes of the wild salmon. When the wild salmon migrate to the ocean, they are often stressed because of the new environment. Wild pink salmons and chum salmon are most commonly targeted by sea lice because of their small size. Just one or two sea lice could negatively impact the juvenile salmon that are newly adapting to the environment, whereas more than one or two can be fatal. Salmon farms negatively affect the environment and biodiversity mainly because of their locations and how they are built. Salmon farms are built and managed where the rivers and the ocean connect, which means that the species living near the shore get affected the most directly. The First Nations have been against salmon farming for decades with one of their main concerns being how the fish farm wastes are damaging traditional clam beaches, decreasing their stocks and their quality. The decline of the clam stocks quality and quantity results in an issue for many First Nations people who depend on them for food. Also, as the quality of the clams decreases, the health risk of consuming them increases and negatively affects the income of many First Nations people who sell clams. The chemicals used in the fish farm and all the feces and waste produced sinks down and is washed away to mainland inlets by the strong tidal flow. The accumulation of these chemicals and feces has a big impact on clams near the shores. According to the First Nations, in the past the beaches were beautiful and smelled fresh versus now they smell more like a sewer. Since the negative impacts that the clams are facing are accumulative, marine environmental monitoring is being used to try to find out how severe the damage from the salmon farms is to traditional clam beaches. Salmon farming faces problems with the infectious diseases, with the main two diseases being infectious salmon anaemia (ISA) and infectious hematopoietic necrosis (IHN). The ISA was first discovered in Norway with in Atlantic salmon. This virus outbreak was common with Atlantic salmon in seawater stage of migrating, but less common in the salmon raised in fresh water phase of migration and is easily transmitted from fish to fish. When an infected salmon reaches the final stage of infection by ISA, the fish experiences a circulatory collapse, internal bleeding and an extreme level of anaemia. IHN is a bullet shaped virus found in both wild salmon and farmed salmon however, some wild salmon such as sockeye, chinook, coho, as well as rainbow trout are not as susceptible to this virus as Atlantic farmed salmon. This virus enters the salmon through the gills and infection begins in the kidney, spleen, and other internal organs. Depending on the temperature of water and species of fish, the IHN could affect the population of the fish at varying speeds. As the majority of farmed salmon are Atlantic Salmon these viruses are especially significant. Salmon enter British Columbia’s market from one of three sources; from salmon farming, commercial fishing of wild salmon and from sport fishing. While salmon farms are responsible for a significant portion of salmon in the BC market, according of the Economic Impact Study Final Report done by BC’s Special Committee on Sustainable Agriculture in 2005, salmon farming contributed less to provincial GDP than commercial and sport fishing combined. Though the salmon farming industry does contribute to BC’s economy, there is concern about how the industry is negatively affecting other industries. With more salmon flooding the market with the rise of salmon farming, prices for salmon caught in the wild as well as salmon raised in a farm has dropped, negatively impacting the commercial industry. Areas that were once available as tourism destinations and tour locations are no longer accessible due to the spread of salmon farms on the Pacific Coast, often harming the tourism industry as well. With advances of technology, salmon farms now have the capacity to increase their production while opening up very few new jobs. Studies looking at employment in different industries have also shown that while salmon farming does create jobs, it creates nowhere near the same number of jobs as commercial and sport fishing, meaning that expansion in the salmon farming industry isn't a large contributor to lowering unemployment in Canada. As a traditional important source of food for many coastal First Nations people, salmon are often intimately linked with both First Nation’s culture and ways of life. Though commercial salmon fishing began on the coast of BC around the 1800’s, First Nations people have been fishing salmon for time immemorial. It is difficult to express exactly how important salmon and other marine wildlife are for many First Nations groups living near the coast of BC, not only for food, but socially and culturally as well. This importance can be seen in the song, dance and art of First Nations communities along the coast where marine resources fed entire villages. Salmon contains many beneficial nutrients such as protein and omega-3, however, there is a difference between consuming wild salmon and farmed salmon. Farmed salmon are raised in a high density, closed environment system. To keep the salmon healthy during growth in a crowded net, antibiotics and other chemicals are needed. One of the main chemical compound that is a concern is the dioxin concentrations (DLCs). These dioxin-like compounds are highly toxic environmental persistent organic pollutants (POPs) and the level of DLCs is significantly higher in farmed salmon compared to wild salmon. In fact, it is the highest in the FDA (Food and Drug Administration) total diet survey which includes other meat and dairy products. The high levels of DLCs in the farmed salmon puts salmon consumers at a higher risk of cancer than wild salmon. If humans were to consume farmed salmon more than twice a week, their risk of cancer is 1 in 1,000. This risk can be decreased to 1 in 100,000 if farmed salmon are only consumed less than once a month. Suffice to say it would be wise to be concerned about the health impacts of eating farmed salmon. Collaboration between First Nations groups and salmon farms has been successful in multiple instances in British Columbia. Salmon farms can benefit from the ancestral, traditional and local place-based knowledge of the First Nations groups, and the First Nations groups can benefit from the salmon farms using this knowledge in their management practices, from the employment opportunities provided and from having a larger voice in aquaculture decisions. As of 2016, there have been twenty social and economic partnerships between BC Salmon Farmer Association members and First Nations groups and "78% of salmon raised in BC is done in partnership with First Nations." After many discussions between the Tlatlasikwala First Nations and the salmon aquaculture company Marine Harvest Canada, in 2013 a collaborative agreement was signed. This mutual agreement provides Marine Harvest Canada with an opportunity for business growth, while making it possible for the Tlatlasikwala First Nations to reclaim Bull Harbour, a part of their traditional territory. It also provides some of the community members with jobs and the ownership of two aquaculture tenures to the Tlatlasikwala First Nations. The first protocol agreement was signed between the Ahousaht First Nations and Mainstream Canada (now Cermaq Canada) in 2002, but in 2010 after many meetings a new protocol agreement was signed. With the new 2010 agreement, both parties worked towards mutual understanding, transparency and working through difficult past relationships. Through this partnership, the Ahousaht gain recognition and respect for their traditional lands and titles, employment and contract job opportunities as well as funding for wild salmon enhancement projects and education. Cermaq benefits by the security of long-term stability for their operations, the addition of a local workforce and access to the local placed-based knowledge of the Ahousaht First Nations. On a broader scale, these partnerships and the many others like them are part of the progress towards a better relationship with the local First Nations and the environment. They work towards more sustainable salmon farming practices that integrate First Nations knowledge and understanding and are a great example of the advantages of collaboration. The precautionary principle advises governments to err on the side of caution if there is a potential threat of damage to the environment but a lack of solid scientific agreement.Implementing the precautionary principle when considering matters such as expanding the salmon farming industry or granting more salmon farming licences has been suggested as one method of attempting to control further environmental harm as a result of salmon farming. Closed-containment refers to systems where the salmon farm is isolated from the external environment, compared to the commonly used net-pen systems. Closed-containment can mean either land-based systems or closed off containers in the water. The benefits of closed-containment are numerous, but so are it's complications. By being more isolated from the external marine environment, farmed salmon are much less likely to pass off viruses or bacteria to wild salmon. Escaped salmon would also much less of an issue, predation on farmed salmon would decrease and the process would require less antibiotics, pesticides or similar. Financially, closed systems carry more risk, but are theoretically fesiable. Closed systems also require more energy, waste removal is more complex and time consuming and they have the potential to have a larger carbon footprint than net-pen systems if fossil fuels are used to provide energy. Closed-containment systems are by no means a perfect solution, but there are increasing studies being done on their potential use due to the concern of environmental degradation and the negative impact on wild salmon from net-pen salmon farm systems. Salmon restoration on the pacific northwest of Canada is a growing concern for stakeholders across the world. With the number of people impacted by this industry and its negative effects on the environment and indigenous culture, the call for a solution is growing rapidly. 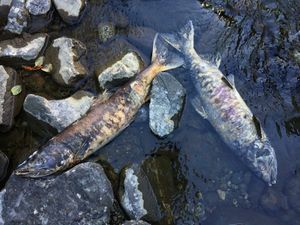 With the implementation of co-management techniques between the government, salmon farming industry, and local first nation groups, this remedial action is becoming an increasing reality. ↑ Nylund, A., Krossøy, B., Devold, M., Aspehaug, V., Steine, N. O., & Hovland, T. (1999). Outbreak of ISA during first feeding of salmon fry (Salmo salar). Bulletin of the European Association of Fish Pathologists, 19(2). Retrieved April 10, 2018, from https://eafp.org/download/1999-Volume19/Issue 2/19 2 70-74.pdf.